First off, my apologies from not posting yesterday or early today, I’ve been a little under the weather. I was however, at the Mets game last night. And it was a truly magical night. 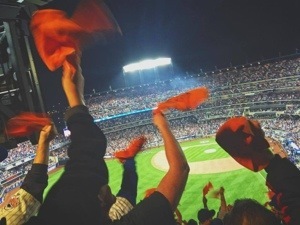 The energy in the ballpark the first 5 innings was something I’ve never experienced before in Citi, or even at Shea. Now, I only went to games at Shea in 2004 or later, so I watched games at Shea during one depressing years, but also two good years, and while I wholeheartedly agreed that the noise at Shea just didn’t carry over to Citi, I think it surpassed it last night. Sure, I bet the 1986 World Series was more electric than last night. One view of a play from that year on reply will tell you that, but last night was so fun, that I can’t wait to see what this place will sound like during a World Series, which is now only 5 wins away. One of the most special moments of the night was when Ruben Tejada came out limping on one of Teresa Taylor’s Bat Canes. The place went absolutely crazy, with 44,000+ on their feet.